Call it “lifestyle at the high end.” Yes, I know “lifestyle” can be a dirty word in some audiophile circles, but the Berlin-based Burmester brand has never shied away from bringing luxurious aesthetics to its high-end components. Yet there’s always been plenty of substance behind the style. Designed for music lovers who aren’t “typical” audiophiles, the company’s new, unique, and user-friendly Phase 3 all-in-one system adds dramatic flash and panache to the solid build-quality and stellar sonics the German manufacturer is known for. It’s also a conversation-starter! What is the Phase 3 system? What does it do? It’s packed so chock-full of capabilities it might be easier to say what it doesn’t do. Available in either the crimson-and-chrome Bauhaus-inspired “Retro Style” (the sample reviewed here) or in the darker-metal industrial “Loft Style,” this striking three-piece system includes a pair of the company’s powerful B15 loudspeakers and its 161 Musiccenter all-in-one unit that contains technologies from the 151 Musiccenter plus speaker cables and a power cord to connect everything. 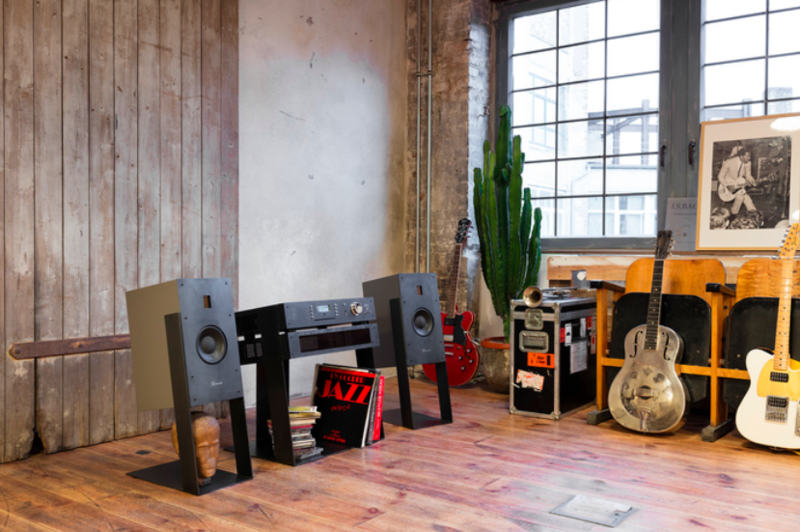 The substantial chassis holds a 170Wpc integrated amplifier, DAC, server, CD player (with ripping capability), and streaming DAC with built-in access to a variety of streaming services, such as Tidal, Apple AirPlay, and more recently, Qobuz. There’s a generous array of inputs (analog XLR, digital RCA, and TosLink) and outputs (analog XLR and RCA, digital RCA, and TosLink), plus five USB (one on front), one RJ-45 Ethernet, and two coaxial inputs for WiFi antennae. In short, it’s quite the comprehensive, compelling, and, dare I say, convenient package. But there’s more to the story, so let’s back up a bit. Dieter Burmester was a passionate musician (electric bass and guitar—he had an extensive collection of them). Reliability issues with a tube preamp amp he’d owned ultimately led to the creation of his first amp; he couldn’t find a model that satisfied his ideas for build-quality and sound performance. After earning an electrical engineering degree he decided to pursue new specialized solid-state circuitry developed for medical measuring instruments that could be leveraged for new amplifiers he began designing. Dieter founded his eponymous company in 1977 based on principles of top-notch workmanship and innovation—where new products are only launched if they represent technical advancement. All products are still developed in-house and built by hand in Germany, which means they don’t come cheap but are created to look and sound great for the long haul. The use of chrome on the faceplates of Burmester components has been a trademark of the brand since its earliest days; its appearance also reflects a sense of timelessness in its associations with Art Deco style—the Bauhaus-inspired look of the Phase 3 under review, for instance—as well as a nod to classic cars (and Dieter’s vintage steel guitars). Speaking of which, audiophiles who are also car aficionados—and there are many—probably know that the Burmester company also produces automotive audio systems for luxury car brands, such as Mercedes-Benz, Porsche, and Bugatti. (For more on the late, great Dieter Burmester and his eponymous company, please see The Absolute Sound’s Illustrated History of High-End Audio, Volume 2: Electronics.) Indeed Dieter’s vision for the Phase 3 originated from cooperation with the Burmester automotive divisions; he wanted to offer an all-in-one system designed with a lifestyle character and intuitive use more akin to a car system or a piece of furniture than to a classic audio two-channel setup. The 161’s all-chrome (in my Retro Style model review sample) front panel has a disc-slot front and center, plus a USB Type A input, and a ¼-inch headphone output. To the far right is a small cockpit-style lever switch to power on, off, or standby. There are two sets of four control pushbuttons to select sources and disc player functions, and a small, 8-character, dimmable green point matrix display panel to show volume level, source, functions in progress, myriad status updates, etc. To the far left, a column of six small LED lights indicating sources (green light) and network connectivity (green or orange or red if there’s an issue). Each light and button’s function is identified in tiny engraved text—a nice touch that’s both luxe and idiot-proof (albeit unreadable unless you’re right in front of the chassis). Although the buttons are nice to the touch, my fingerprints quickly marred the mirrored chrome surface; happily there’s a quite comprehensive remote control, but it turns out the Burmester iPad Mini app is needed for the heavy lifting. More on this later. One minor ergonomic quibble with the chassis: Its top edge extends out a couple of inches beyond the actual back panel—presumably to partly obscure the back panel ins and outs, etc. from view—and this combined with the chassis’ slight downward-tilted angle made it hard to peer over the top to see and access the connections. That said, I had the unit placed fairly close to a wall; if the unit is placed more centrally within the room this won’t be an issue.